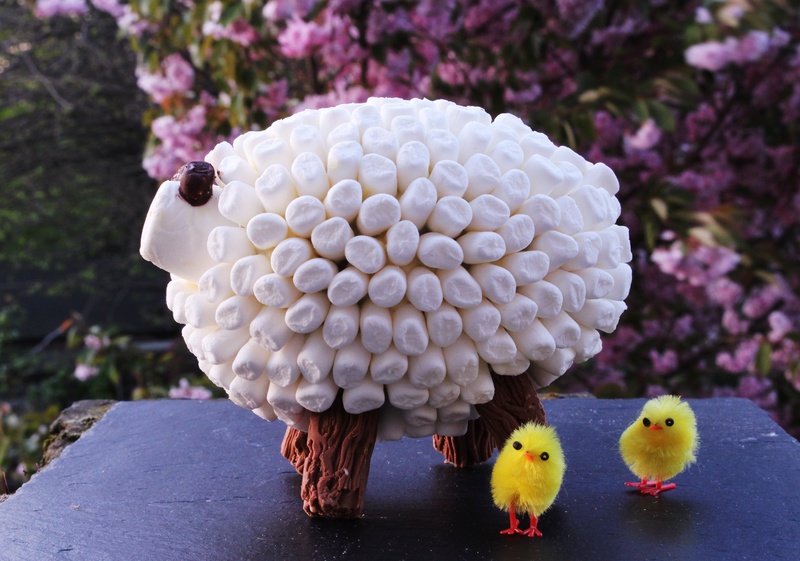 A marshmallow sheep for Easter | dash.drizzle.dollop.devour. Never let it be said that I don’t appreciate a bit of kitsch in the kitchen. Easter is a great time to set about the kitchen on a sugar-fuelled high and make cutesy little creations like this. I have a little niece and so this was ostensibly made for her; in reality I’m the one who is totally overexcited about it. It’s a very straightforward creation – a simple chocolate Easter egg meticulously covered with mini marshmallows. This might be a good project to do with children, although they would need to be fairly patient children, as it does need a little attention to detail and time to let it set now and then. You will need a small chocolate Easter egg and a chocolate flake to start with. Carefully cut the chocolate flake into four equal pieces to use as legs. Melt some of your white chocolate to use as glue, then dip one end of each piece of the flake into the white chocolate and stick them to the side of the egg to form the legs. Leave to set for 10-15 minutes. A quick note on the white chocolate. You will need between 100-150g white chocolate in total, depending on how generously you coat the marshmallows and how much finger dipping goes on. I suggest melting it in small batches just to prevent having to re-melt it, which increases the risk of burning it. Next, attach one large marshmallow to one end of the egg to form a head. Again leave to set. Now beginning sticking on the mini marshmallows in layers, again, just dipping the tips of them in white chocolate. I suggest you start on the underside around the legs and work upwards. They need to be packed together nice and tightly, so you need to be fairly methodical, building them up layer by layer. I found it easiest to build a few layers then allow to set for 5 to 10 minutes before continuing, otherwise they can begin to slide about. It’s also much easier to manoeuvre the sheep around if some of them have already set. Once your sheep is completely covered, coat a couple of marshmallows in dark chocolate and stick to the head to form ears. Accessorise with fluffy chickens and a blossom tree. I have no idea where I got this idea from, but when I told my mum about it, she said she was about to make the exact same thing, so clearly a penchant for cute sugary confections just runs in the family. Shopping list: 1 chocolate easter egg, 1 chocolate flake bar, 150g bag white mini marshmallows, 1 large marshmallow, 150g white chocolate, a couple of squares of dark chocolate.